Peter Popoff is a false prophet!!! His website is at www.peterpopoff.org. Peter Popoff promotes his Miracle Water. Sadly, many people have fallen victim to this blatant scam. Popoff's TV show uses lures of a better job, better health, and more money to sucker people into sending him a donation. "And found in the temple those that sold oxen and sheep and doves, and the changers of money sitting: And when he had made a scourge of small cords, he drove them all out of the temple, and the sheep, and the oxen; and poured out the changers' money, and overthrew the tables; And said unto them that sold doves, Take these things hence; make not my Father's house an house of merchandise." Christianity began as a new birth in the Lord Jesus Christ. When it went to Greece it became a philosophy. When Christianity went to Rome it became an organization. When it spread throughout Europe it became a culture. And when Christianity came to America it became a business. This is so tragic! Whether it be Mike Murdock begging for a $58 "uncommon seed," or Peter Popoff begging for people to purchase his Miracle Water, God condemns turning Christianity into a business. 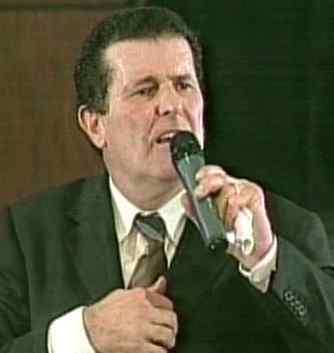 Peter Popoff also speaks in demonic Charismatic tongues, making a mockery of God's power through fraudulent healing services. In these services people fall back onto the floor, jumping up and down like idiots. Popoff's greatly promotes his Miracle Spring Water, promising special healing and blessings to those who purchase and drink it. Of course, this is of the Devil. Watching a Peter Popoff crusade is similar to watching a freak game show. The music is ridiculous. I've said it before and I'll say it again―why don't these Charismatic healers restore any amputees? It's because they can't. The alleged healings are always limited to unseen illnesses. The truth is that NONE of those fakes can heal anyone! One theme is repeated over and over by the lying televangelists―money, money, money. It's all about money to them. If you're stupid, or just plain ignorant, you'll send them money. Please do not send them any money. Peter Popoff is an imposter, who ought to be ashamed of himself for exploiting the name of Jesus to make money.